It's not been too many years since I was looking for a junior set for my second son who, as luck (or misfortune?) would have it, is left-handed. If you've ever tried to find a set of golf clubs for a lefty -- and a junior -- then I'm sure you share the frustration I felt back then. Orlimar has made a set that might remedy that, however. The folks at Orlimar have been around since 1959 and, in my opinion, have been making very good quality, yet affordable, golf equipment for some time now. This junior set called "Fury" by Orlimar features a 14-degree driver, 28-degree 2-hybrid, 6/7-iron (combo), putter, and stand bag. Designed for the golfer in the 8-12 year old range, this set has a good make-up without getting too complicated for the young player. The driver is oversized (360 cc) and easy to hit. The 2H is a passable club for most any long shot from the fairway, and the 6/7-combo iron is a great all-around club for those shorter approaches and chips. The putter features heel-toe weighting and has an extended head for nice balance and easy alignment. Each club is fitted with a composite shaft in Junior flex -- a flex that optimizes distance at slower swing speeds common to young players. The stand bag is outfitted with multiple zippered pockets and a double carry-strap for even weight distribution across the shoulders, something all carriers should have but especially important for the junior player. 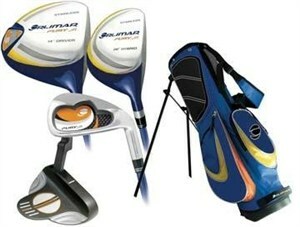 Golf is supposed to be fun, and the Fury junior set from Orlimar should be deliver that nicely for your junior player. Lightweight, easy to use, and yet full-featured -- I only wish options like this had been around a few years when I was looking.